A friend of ours had a birthday this past week and at the spur of the moment, she decided she wanted to come up to our neck of the woods and do something. Conveniently, there was something we’d been wanting to do, and without knowing it, she gave us the perfect excuse. We have a very small sailboat moored just outside of Cowichan Bay. 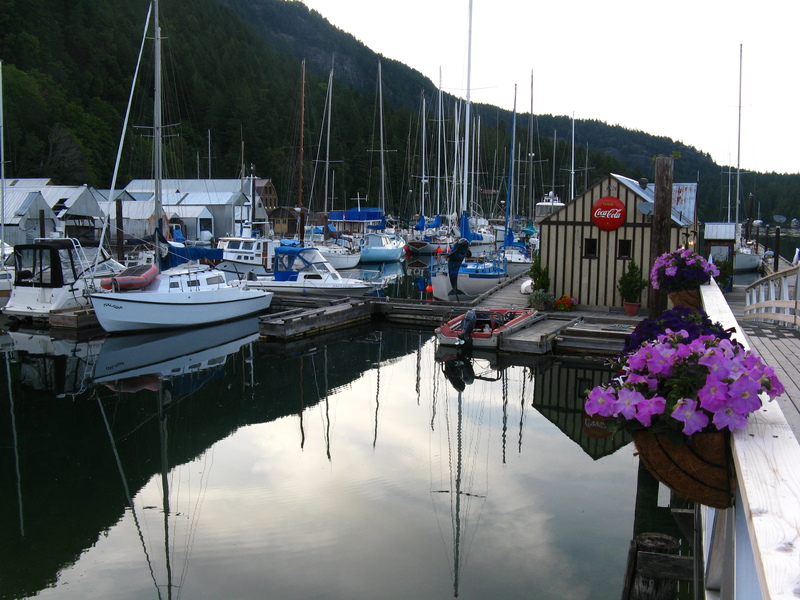 Our closest destination across the bay is another small bay, Genoa Bay. It’s a tiny spot, with just a few houses on the point and a marina with some float homes and sailboats. 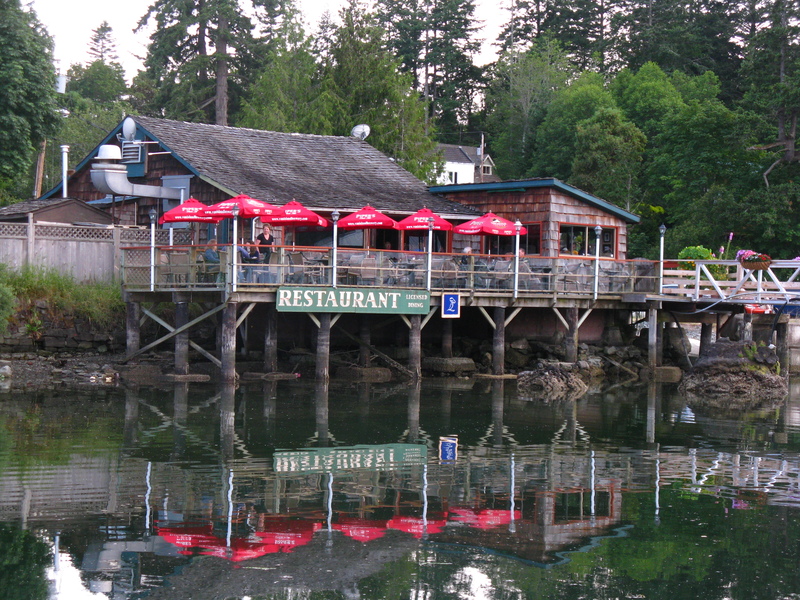 But it has a not-so-hidden secret: the lovely Genoa Bay Cafe. Skipper and I had a lovely dinner here years ago, but had heard that things had gone downhill more recently. Until new owners and a new chef took over in February–since then it’s been nothing but raves. On a beautiful afternoon a few weeks back, we sailed over and had no luck getting in for dinner; even with the patio, they were booked solid. Lesson learned: call ahead, even on a weeknight. So we did! Got a reservation for 6pm, all arrived at our place at 5pm, we set sail at 5:30pm, and even without high winds, we docked up at the marina’s transient finger at 6:01. After a warm greeting, we were off to the patio to admire the view and begin the relaxation process. First up, beer. Unfortunately, this was the only complaint. 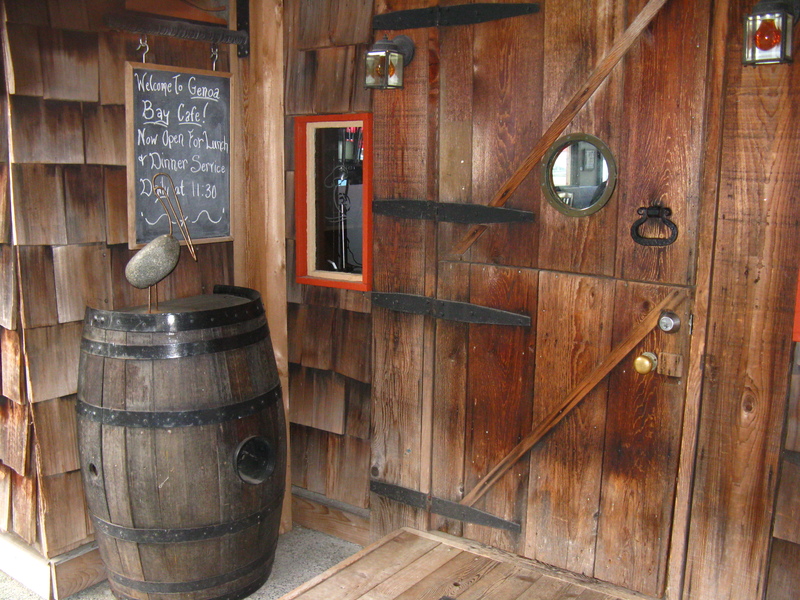 They have the usual suspects, but for a restaurant of this caliber, we were surprised that their only craft or micro brew was Vancouver Island Brewery. So Piper’s it was. Not my first choice with all the amazing beer out there these days, but as I said to the server, if I HAVE to sit on the patio on a summer night and enjoy a beer, I guess I can manage whatever they put in front of me! We managed to tear ourselves away from the view and the conversation and take a look at the menu. It’s small–the kitchen must be tiny!–but reasonably varied, and very fresh. Note to vegetarians, though, you might get lucky with the specials, but otherwise you’re out of luck. I wouldn’t be surprised, though, if they would accommodate you upon request when you call ahead. We started with Saltspring Island mussels in white wine and BC Calamari. The mussels were delicious, but the calamari was a revelation. Tender strips had been “ginger marinated” and then deep fried. They had a very light batter of some sort (not often I’m stymied, but this might have been just a light flouring), so they weren’t crispy like calamari often is, but wow. Fantastic. For mains I tried the halibut and chips, our friend had a burger, and the Skipper decided to splurge on the 8 oz Ribeye with garlic mashed potatoes and seasonal veg. Though the prices were comparable with many higher end restaurants we’ve been to, the portions were definitely more generous. The fries, and you’ll have to trust that we are connoisseurs in this regard, were outstanding. Kennebec potatoes, again very lightly deep fried, not greasy at all, just light and crispy with lots of flavour and not overly salted. The burger was approved, the steak was cooked exactly as requested, veggies were not just a pretty side, and the garlic mash was creamy and savory. My halibut, like the calamari, was deep fried almost without batter–not a finger food because of it, but delicious, tender, and as fresh as it gets. My only quibble was the apple-fennel slaw, which was a little goopy with mayonnaise, rather than the julienned, crunchy, vinegary freshness I was hoping for. Despite the portions, we decided we couldn’t resist homemade dessert. Warm berry crumble and Callebaut chocolate terrine were worth being stuffed to the gills as we stumbled out. The service was outstanding, the view second to none, the food worth paying more for. A friend was recently cranky about paying $16 for a burger at the Canoe Club in Victoria. I think we all get cranky when we’re getting basically the same meal that we could have had cheaper somewhere else. But when food is so well-prepared, and goes beyond the care that we might take at home (no matter how passionate I am as a home chef, a Tuesday night is not usually quite this extravagant 🙂 ), then we are happy to pay the extra. And by the way, the burger here was $13.50. And the best part? Not having to drive home! Heh. Cranky Friend here, This place sound great!